Baby, it’s hot outside! Chill out with these fun ways for your family to cool off. Channel your childhood and start a balloon fight with your kids. Fill up a bunch (we’re talking a huge bucket-full) beforehand so you don’t run out mid-battle. Once the battle dies down, play a few games with the leftover balloons. Grease up your hands with cooking oil and toss the balloons back and forth, or just throw them at the ground and see who can make the biggest splash. Set a few sprinklers up in your yard and have fun running through them. Shop at toy stores and online for sprinklers that move in unpredictable patterns so you can try to dodge the spray. Not everyone has the space or money for a large pool. You’ll be surprised how much you can cool off with a little plastic baby pool. Fill it up and stick your feet in it, or just sit down and get wet up to your waist. When you’re done playing, don’t just dump out the water. Use it to water plants around your yard. Don’t blow money on water guns. Pick up a few spray bottles at the dollar store and use them for a battle with your kids. Use the misting setting for younger kids, or the stream for older ones. 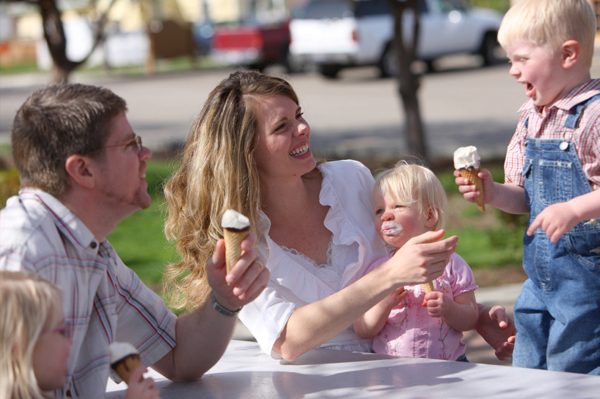 Serve up some ice cream from your freezer or hit up the local ice cream parlor. As soon as that ice cream hits your mouth, you’ll start to cool off. We all want to get outside and enjoy the summer sun, but sometimes enough is enough, especially when it comes to the heat. Take the party indoors with a trip to a mall or a movie theater. Soaking up some air conditioning will do everyone a little bit of good.